We have had a lot of discussions at our house lately about being brave. My daughter has a little brother so I often find her reverting back to her baby ways when she is feeling a little unsure of herself, especially at night. Which is a totally normal response for a child her age. However it is not always a desirable or convenient response for us. Good Night, Sleep Tight, Don't Let the Bedbugs Bite! is a great story to help address the issue of being afraid. Little Gilbert goes on an overnight camping trip. He is having a great time until a fellow camper spooks him with stories about the Camp Hi-Dee-Ho ghost. But Gilbert learns to overcome his fears when he must go outside in the middle of the night and face the scary noises all on his own. This story is a perfect read aloud for any child who is trying to conquer their fear of the dark. 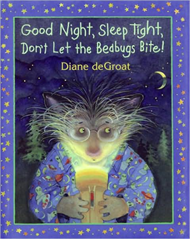 So turn those lights off and fire up the flashlight to read this fun little story to your kids. As many of you know we recently camped out in our backyard to celebrate the Great American Backyard Campout Our daughter was a little uneasy about sleeping outside without her trusted nightlight so we decided to have her create her very own camping lantern to take with her on her camping adventure. Gather some red, orange and yellow construction paper cut (or trace for your child to cut, depending on age) flames out of the tissue paper. Since my little one loves to use her scissors, I had her help me by making tiny slits onto the flames I had cut. Have your little one glue their flames onto their strip of construction paper. When dry, roll it up and slide it into your container. Place a flameless battery operated candle inside and your lantern is ready to use. This activity is a perfect way to tackle those nighttime fears. They can keep their lantern by their bedside. For each night they stay in bed without getting up or getting upset they can earn a sticker to place on their lantern. I love a good game of memory it is so timeless and fun...right up there with Go fish! We had some fun making our very own memory game. I had my daughter collect some leaves and we placed matching camping themed stickers on the back. Turn them over and you have a game of memory. Take turns overturning the leaves trying to find a match. Enhance your little ones camping vocabulary by describing what the items are used for as you overturn each leaf. If you want to take it a step further you can use alphabet letters to represent the initial sound of each word. Have your child match the picture to the sound. You could also use small stickers (like ladybugs) and create a number word matching game. Spell out the number word and then on the corresponding leaf use that many stickers. The possibilities are endless! Marcy, Our oldest has also been working on begin brave! I will have to find this book at the library next week! Thats lantern is super cute too! Thanks for sharing on Saturday Show & Tell at Cheerios and Lattes this weekend! If you're interested, we would love to invite you to also link this up to the Summer Activities for Toddlers Collection! Here's a quick link: http://www.cheeriosandlattes.com/summer-activities-for-toddlers/ This would be a perfect activity to do with young ones!